Sinful Colors is on such a hot streak with great new shades lately! I bought the whole Hot Flash Metallics collection, all but one from Enchanted (or Muse), and Polar Opposites. That's nine great new shades from them in just one month! I passed on their Bewitched and Take A Bite collections for Halloween, since most shades were repromoted and I already owned the ones I wanted. Holiday Shimmers has two repromoted core shades, Queen of Beauty and Frenzy, but the other six are new. I bought four of them...that makes a whopping thirteen awesome new shades in just a couple of months! Yay! Holiday Shimmers has a great variety of textures *and* it's very on-trend and similar to some new polishes from salon brands. Faceted really surprised me! It's a mix of iridescent bar glitter and tiny round royal blue glitter. I picked it up on a whim, partly because of Chris from Impoverished by Polish. I hated bar glitter for yeeeeeears, since my first bottle in high school. I swore it would be my last. It might also have been Sinful Colors, but it's long gone so I don't even know. Bar glitter has a bad reputation for looking like hair...because it can. I sponged this on for more of a confetti look. Matte top coat brought out the iridescence even more. Let's Talk is a bit too close in color to the small glitter in Faceted to show it well, so I also wore it over Mint Apple. That brought the little round glitter out more...but made the bar glitter less obvious. Oh well! I mattified this combo too. ...again with the bright yellow...sorry! Dazzle was a bit of a surprise too, but not a shock. You could call Dazzle dark pink...but I won't let you. This is fuchsia! I like fuchsia. I like magenta. I do not like pink! I like Dazzle...a lot! The formula is very thick, but it still applied well. I used two coats. It's a deep and lively fuchsia, packed densely with slightly lighter magenta flecks that hint at copper in the bottle. You see it on the nail, but suddenly, in flashes. ...another apology...I took these photos of Dazzle during Hurricane Sandy. I was at work, but not in the office I'm usually in (which is awesome for duochromes...I really should have waited!). We didn't lose power, but the room I was in didn't have the best lighting for photos. I thought about redoing it, but I have so much stuff I wanna post in the next few weeks. Oh well. I hope this gives you some idea of the copper flash that lights Dazzle up when the light catches it right. It's really lovely....and it's not pink! ...right? I wouldn't call it a dupe by a long-shot, but it's along the same lines as OPI You Only Live Twice, a magenta packed with fleck shimmer with hints of copper. Nova might be my favorite of the four I chose. If you love deep, mysterious shimmers that play with the light (like e.l.f. George, Arthur, and Stanley), you'll love Nova. The base is a navy blue, almost midnight blue, jelly that comes alive with blue-green beauty in bright light. In lower light it's almost black, but the shimmer still glows when it catches the light. I really love Nova! Like Dazzle, Nova is also very thick. Not too thick to be manageable though, and it applied nicely in 1-2 coats. I was wearing it when I held a bottle of OPI Live And Let Die (before I bought mine). They're cousins, slightly distant ones, but there is a similar feel to them. Nova could also stand comfortably among the Essence Breaking Dawn pt2 polishes and might soothe you if you missed them. 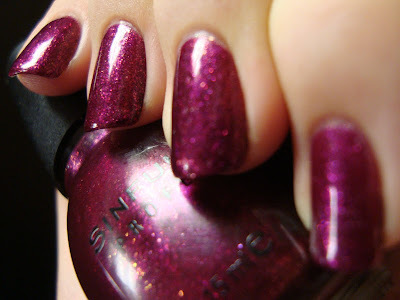 Winter Wonder is almost an exact dupe of On Her Majesty's Secret Service, which means it's also a dupe for Zoya FeiFei. It's a sheer, thin gray-blue base with tons of little flecks, both golden-green and a blue that shifts to purple at some angles. That gives it a ton of personality! There might be ever so slightly less of a shift to the duochrome flecks, but you'd have to be paying unhealthy attention and staring too hard to notice it...and maybe I'm just seeing things. Dunno. It's fairly sheer at first, taking three coats for full opacity like most polishes with this finish. I layered it over black, just to see the result...and it brings out some tones you don't notice as much when it's on its own. Look at that indigo glimmer! The golden-green flecks stand out a lot more this way too! Oooh! I'm really thrilled with Dazzle and Nova especially, but Faceted was a nice surprise and a bit of a challenge to my usual preferences...and it's great to see a $2 drugstore dupe for salon polishes, so I'm happy to have Winter Wonder! There really is sooooo much more great new holiday polish to come...I'm in the midst of a swatching frenzy here! Loving it! Poor Nichole has a bad cold, so I'm not sure if she'll be posting this week. These are really cute! I'm not usually a bar glitter kinda gal but I like that one the most. Love it! I got Faceted and Winter Wonder. I also loved Faceted but normally hate bar glitter. It'll be a fun one for the holidays, for sure! Great swatches. Thank you! :D Faceted is really a pleasant surprise. I've also become a huge fan of Sinful Colors recently. I had at least 20 or 30 of their polishes before, but this year I've bought over half of their new releases, and I love them all. I love the variety and uniqueness! I didn't own any until this year (I may have had one or two in the '90s), but now I have 46! They're amazing enough, but mindblowing for a drugstore brand.